Is that really an ST prototype ? Re: Is that really an ST prototype ? Looks more like a STF PCB mounted in a STE case. The STF and STFM only had two 9 pin joystick/mouse connectors mounted under the keyboard. Atari added two more (non-standard) Joystick connectors to the STE. The STE also had extra audio connectors. 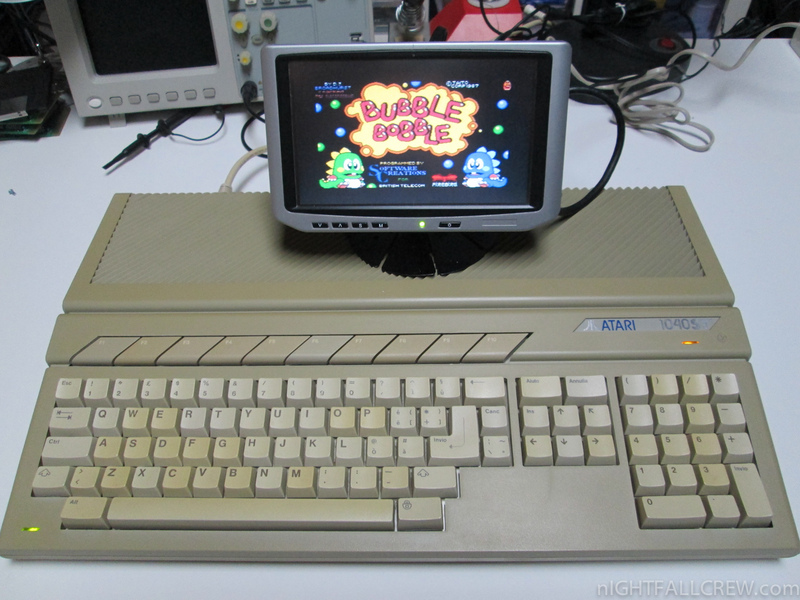 The first Atari ST machines used a smaller case with an external PSU, no internal FDD and the original 9 pin joystick/mouse connectors were on the side of the case. As a comparison, here is a listing for an Atari ST machine. Note the difference in the case, the external PSU, etc..
Last edited by 1024MAK on Sun Feb 04, 2018 4:15 pm, edited 1 time in total. LOL! This is indeed "a very unique machine", as the vendor writes. But not because it's some rare prototype but because it looks like it's been ripped apart (notice the missing chips and the damaged capacitor) and then placed into the wrong case. Also the C103088 motherboard revision is neither particularly rare nor is it very early like the vendor claims. You can clearly see from the date code of the PCB and the components that it was manufactured in 1988, 3 years into the production of the ST.
EDIT: It's an STF though, so 1988 is about two years into its production. I'm sensing a business model here: Buy cheap STs on eBay (don't have to be working), rip them apart, exchange cases among each other, sell them as "ULTRA RARE PROTOTYPE!!!". Last edited by czietz on Sun Feb 04, 2018 4:09 pm, edited 1 time in total. Thanks for your help, I'll save my money. czietz wrote: I'm sensing a business model here: Buy cheap STs on eBay (don't have to be working), rip them apart, exchange cases among each other, sell them as "ULTRA RARE PROTOTYPE!!!". Ugh... bad enough when the prices sky rocket. I would have done that when I still was a nice guy. Looks strange there's no TV output when a case is similar to the STe otherwise. Keyboard also has some foreign language keys and some strange ones like Caps Lock and Clr Home. Marakatti wrote: Looks strange there's no TV output when a case is similar to the STe otherwise. Keyboard also has some foreign language keys and some strange ones like Caps Lock and Clr Home. French STE has no RF out. I agree I haven't seen some of those key caps before though. As you can see from keys like "Aiuto" or "Cancellare" this is an Italian keyboard. The Shift and Caps-Locks keys are not unique either, they can be seen for example here: http://www.nightfallcrew.com/wp-content ... G_2390.jpg. I wonder if they were standard on Italian STEs or an after-market item. EDIT: Even modern Italian keyboards have the symbols: https://www.vendooh.com/1660/tastiera-i ... vo-usb.jpg. Maybe it's some kind of national standard? Last edited by czietz on Sun Feb 04, 2018 9:18 pm, edited 1 time in total. The only interesting on this is that "/ATARI ST/" label on the top cover. That might be from a prototype, but the rest not, the total thing is just a Frankenstein's monster. Maybe strange is also that the STE bottom has no sticker as well, but it also could just have been removed. I would only take it for 10 euros incl. free shipping. And maybe even that is too much for the top cover with special label. It wants reporting to Ebay as misleading and fake so that someone does not fall into a trap! The one on the link looks more like a Frankenstein's. Atari never released anything like that before IMO. Even on protos the ports were at the correct places. As they said before it's probably recased in an STE bottom. All of the STs with this badge were F or FM that I've seen so far. Adding to that French STE bottom since there is no TV out.